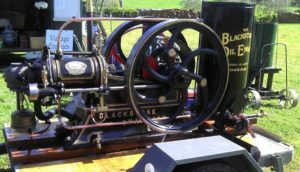 Find inspiration from Lost Trades and view vintage engines rebuilt by our members who have the skills, passion and knowledge of an era long ago. The engines are operated by our members and can be seen working on event days or for group tours by arrangement. 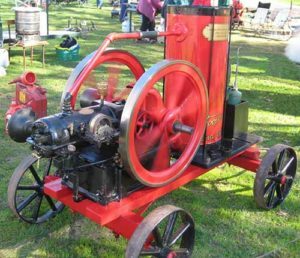 Also on permanent display are old household items, engineering equipment, agricultural gear plus much more. 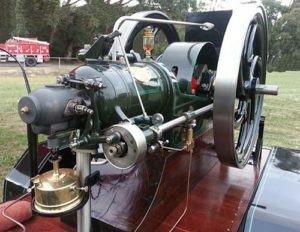 The Yarra Valley Machinery Preservation Society was formed during 1988, combining the interests of a small group of enthusiasts with a common goal, the preservation and restoration of old machinery, particularly internal combustion engines. Our members are skilled in many forms of metal working practices, including casting of metals, manufacturing replacement parts, welding, blacksmithing & etc. These skills and interests are being passed from member to member. YVMPS assists many groups within the community by displaying at local agricultural field days, community festivals and historical events. YVMPS welcomes your interest, whether as a potential member or just sharing your family heritage with our members at a festival or the club shed at Mont De Lancey. Juniors – 10 years & older – are encouraged to join and take advantage of the wealth of knowledge available to assist in gaining some of these older skills.